Leviton’s Vizia-RF system takes full advantage of Z-Wave’s power-conserving and range-extending 900 MHz two-way RF (radio frequency) technology. 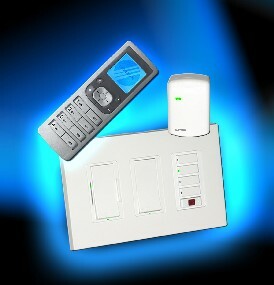 Vizia-RF controllers send command signals to the Vizia-RF network of switches, dimmers, lamp or appliance modules. Should an obstacle block the signal anywhere in the home, the signal is automatically re-rerouted along an alternate path to ensure it reaches the controlled device. Its self-adjusting Z-Wave communications topology gives Vizia-RF unparalleled performance and reliability. Up to 232 Vizia-RF devices can be used in this flexible, expandable wireless network. Earlier this year, Leviton joined with more than 125 companies to participate in the “Z-Wave Alliance,” a consortium of leading-edge companies that are working to incorporate Z-Wave technology into their products. The companies include industry leaders such as Carrier, Honeywell, Motorola, Danfoss, Wayne-Dalton and Universal Electronics. Automation applications range from heating and air conditioning, security and safety, access control and appliance control to home entertainment.